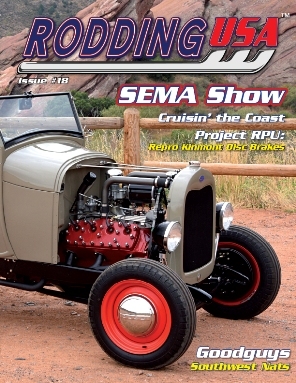 Rodding USA magazine's Issue #18 is available to order now. Magazines ship next day. Issue#18 features an excellent mix of traditional hot rods like Jerry Groomer's '40 Ford coupe, Fred Farrand's Deuce roadster, Steve Frisbie's '50 Ford coupe and Barc Goodson's '28 Ford roadster. Our Special Features section includes articles on Gary Meadors Memorial, Fairway Chevrolet's Collecition, a Shop Tour at Glide Engineering and a Part 3 update on our own Hot Rod Roadster Pickup. Our events coverage for this issue extends to the Road Kings of Burbank, Goodguy’s Southwest Nationals, Cruisin’ the Coast in Gulfport/Biloxi, MS and the fabulous SEMA Show. Plus our regular columns, showcases and our growing dealer network. Rodding USA, by hot rodders, for hot rodders.